An assortment of toppings, some of my favouites include dried cranberries, dried apricots, slivered almonds and mini chocolate chips. 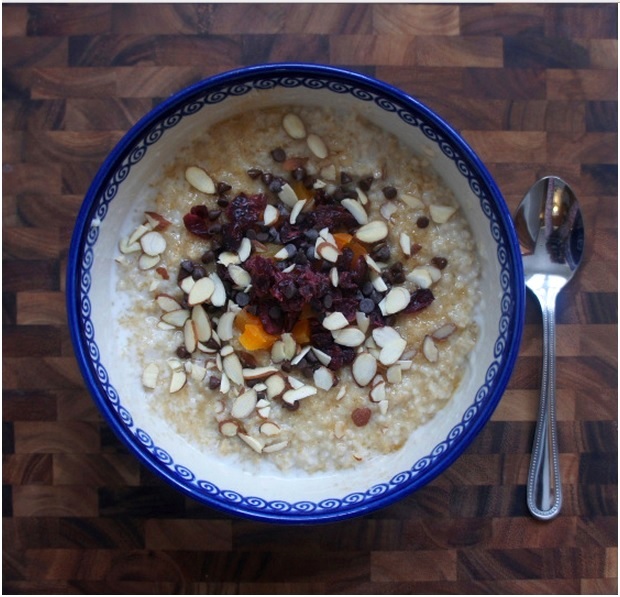 This recipe makes oats for one greedy person (me) or enough to share with your loved one. In a sauce pan, bring to the boil the coconut water and 1/2 a cup of the coconut milk. Add in the oats, turn the heat to medium low and pop a lid on. Cook the oats for around 7 – 10 minutes, I stir every so often and do the bite test. When you have reached your softness preference, stir in the remaining coconut milk. Pour into the bowl(s), sprinkle with sugar and pile the toppings into the middle.